News video editor Kakchingtabam Bipin Sharma of Impact TV, a popular local cable TV operator in Imphal and member of the All Manipur Working Journalists’ Union (AMWJU) passes away Saturday night at his home in Imphal. 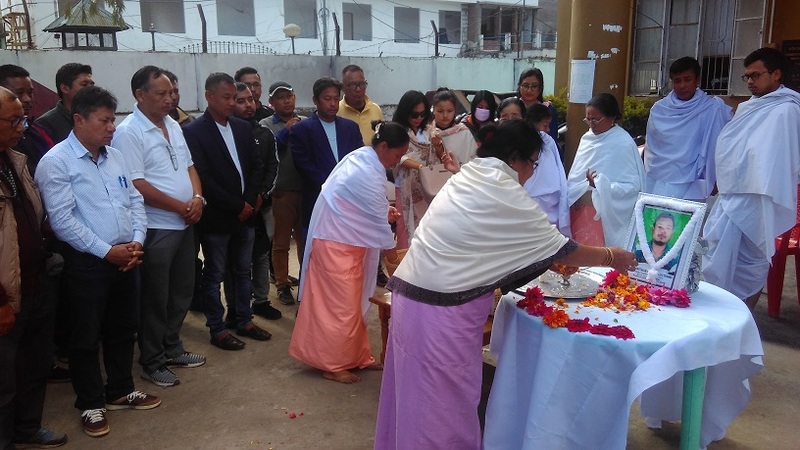 The journalists’ community in the State including members of the AMWJU and Editor’s Guild Manipur (EGM) besides staffs of Impact TV and functionaries of the Khelen Thokchom Trust (KTT) paid floral tribute to the photograph of the departed video journalist at the premises of the Manipur Press Club in Imphal on Sunday. The gathering also observed two minutes silence to respect and honour the departed soul. Later, a candle light observation was also held within the premises of the Manipur Press Club in the evening. The EGM also condoled the untimely demise of long time news cameraman and video journalist and news video editor of Impact TV Bipin Sharma. In a similar a condolence message, KTT also expressed its profound sorrow on the untimely demise of video journalist Bipinchandra alias Bipin who breathed his last on Saturday night at his Brahmapur Harikhagok Makhong, Imphal East district residence after battling a prolonged illness. Bipin started his career as a photo journalist with the then photo agency Eastern Projections and later joined the Imphal Free Press and News Live. In his decade old career, he served as video editor of Impact TV as his last stint. He was 38 and survived by wife and two minor daughters. All Jiribam Working Journalists Union,Chairman Impact TV and its board of Directors and shareholders also condoled the sudden demise of video journalist K Bipin.